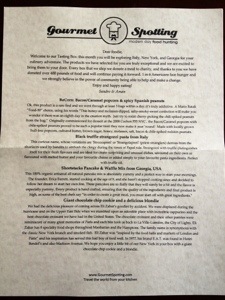 Gourmet Spotting is an awesome gourrmet food subscription scription, that aims to help you “Discover the world from your kitchen.” For $29.99 a month plus $7.95 shipping they will send you a box of 4 to 6 medium to full sized hand-picked gourmet products from around the world. The founders of Gourmet Spotting have and continue to travel the world exploring, eating and now sharing what they have found with all of us very luck people! In addition to sending you a box of delicious gourmet goodies, they also donate a meal to charity for every box they ship. Awesome! 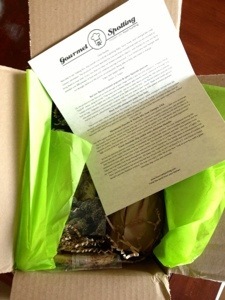 My Gourmet Spotting Box is Here!! We can’t wait to try this as we have loved every single pasta they have sent us (see previous post about ordering multiple multiples!) 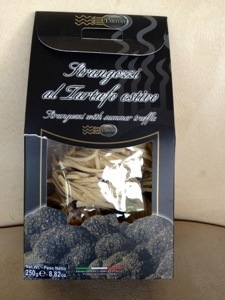 I also love how each box I have tried this far has included an item with truffle as an ingredient! Yummmy! The Dad and the kiddo will really enjoy this for breakfast! Awesome! We can always use more chocolate chip cookies in this house! The approximate value of March’s Gourmet Spotting Box is $36.58. This is slightly lower than past boxes, but because the introduce me to new items and donate a meal for every boxes, it is fine with me!! I am still happy with their newly opened online store that make ordering additional items such a breeze! As always, I can barely contain the anticipation (or stomach rumblings) for next month’s box!